Heat oil in large skillet over medium-high heat. Sprinkle chicken with oregano and salt. 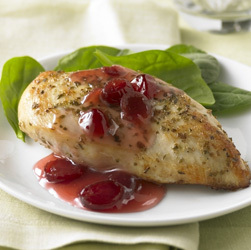 Add chicken; cook 12 to 15 minutes or until no longer pink in centers (165°F), turning once. Meanwhile, stir together juice, cornstarch and brown sugar in microwave-safe 2-cup measure or small bowl until blended; add cranberries. Microwave on HIGH 3 to 4 minutes or until sauce boils and thickens, stirring after every minute. Serve sauce with chicken.